Which Choice is the Right Choice? One of the most difficult things about making decisions is validating you’ve made the right one. When faced with deciding which technology is the right one for your roadways, you rarely get to see what the result of the alternative choice might have been. Let’s take a journey through parallel universes to see how their respective roadways perform. While there may be no scientific evidence for multiple universes, there is plenty of evidence demonstrating how different preservation technologies perform! 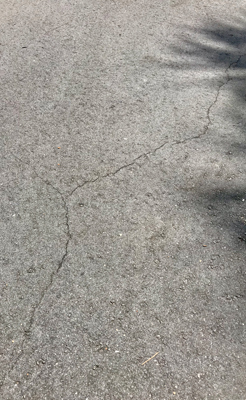 Even newly laid pavements such as these can begin to exhibit small hairline cracks within their first six months of service, as seen in the photo on the right. You may have been around when your roads were resurfaced. Remember how black and smooth they looked? Asphalt roads deteriorate slowly at first, which is why many HOAs and property managers put off doing anything to them. Early distress is barely perceptible, as the road turns slowly from black to gray to almost white. But as the aesthetics gradually change, minor imperfections are occurring. Very small cracks start to pop up, along with the loss of fine aggregate. This type of gradual deterioration speeds up somewhere between years six and ten of a pavement’s service life. Before long, the “do nothing” HOA is replacing its roadways. Small cracks and the loss of fines give way to increased oxidation, followed by water intrusion and more severe cracking. By the time most folks notice there is a problem, it is already too late for a preservation treatment. When the 20th year rolls around, the distresses have accelerated so much the pavement is no longer viable and will have to be replaced rather than preserved. 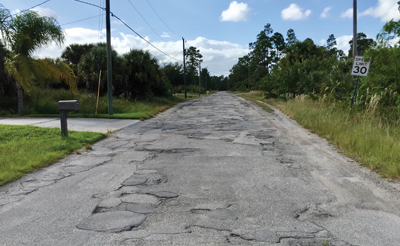 This 20-year old residential road in Palm Bay, FL, is at the end of its service life and will require rehabilitation. Let’s look now at two of the most common pavement preservation techniques. They may as well be from different universes, since they are not only different on day one, but through years five, ten, and onward. As you will see, the same exact pavement will go through drastically different changes based solely on the type of material used to treat it. Let’s look at each universe and learn more about how their parallel roadways react over time. The root cause of aging in the “Do Nothing” scenario was oxidation. The asphalt binder in the roadway loses the light ends in the binder known as maltenes. These components of the liquid asphalt are what give the road its flexibility. Think of it as the glue that holds the road together. In Universe One, the HOA has decided to use a maltene-replacement technology to put back into the pavement the light ends it has lost over time. This is done by spraying an asphalt rejuvenator that is primarily made up of the very thing the road has lost: maltenes. 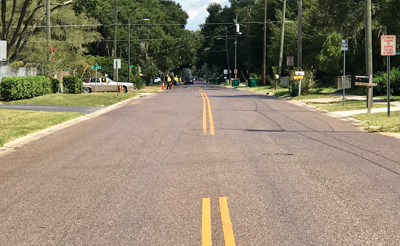 A portion of this road in Davenport, FL, was treated with a maltene-replacement technology about two years into its service life. The pavement on the top is the treated pavement; the pavement on the bottom is untreated. In the maltene-replacement universe, on day one the road looks merely wet. That’s because the black components of the asphalt binder, known as asphaltenes, are not present in the maltene-based treatment. There is no need for the HOA to restripe, and there is no unsightly tracking into the driveways of residents because the treatment dries clear and clean. The residents of this universe experience a minor inconvenience, about 20 to 30 minutes when they are unable to drive on their roadway. The maltene-replacement emulsion penetrates 3/8 inch into the asphalt and begins to soften the asphalt binder. This process, known as fluxing, literally replaces the maltenes that the heat of the manufacturing process and exposure to oxidation have depleted, extending roadway life by five years for this first treatment. The cost of treatment one is less than 10 percent of the original cost of the pavement, i.e., less than $1 per square yard. Over the next four to five years, the asphalt ages more slowly until it eventually returns back to the point where it was five or so years earlier. 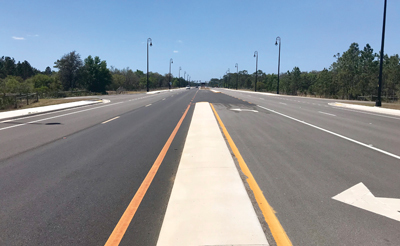 This road in Eustis, FL, received its first maltene-replacement treatment in 2014, when the road was relatively new. Here it is after being retreated in 2018. At this point Universe One’s HOA schedules a second maltene-replacement treatment, which will extend the life of the pavement another five years by turning back the hands of time once again on the asphalt binder. The pavement is now in good condition and will continue to resist the age-related deterioration occurring in the “Do Nothing” scenario. Eventually, replacement will be needed, but in many instances, it may be possible to treat pavements a third time, further retarding the aging process and extending the life of the roads even beyond the maltene-replacement treatment’s 20-year design life. Often, HOA residents pressure their communities to prioritize appearance over function. In Universe Two, the HOA decides to use coal-tar-based sealants primarily due to their shiny new appearance. This treatment is applied in Universe Two at the exact same time as the maltene-replacement treatment was being applied in Universe One. Now let’s examine the differences. On day one, the coal tar is spray-applied to the road. Residents in Universe Two will be inconvenienced for as long as 12 to 24 hours to allow the coal tar material to fully cure. 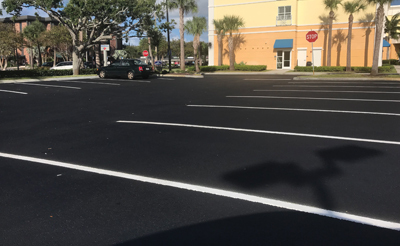 A two-year-old coal-tar-treated parking lot in Vero Beach, FL. Since coal tar is jet black, it will need to be restriped, adding further cost to the HOA’s project. Despite contractor claims that coal-tar sealer actually rejuvenates the pavement, documented research indicates otherwise, as Universe Two’s residents will soon find out. Being a dissimilar material to asphalt, the coal tar treatment actually accelerates aging in the asphalt pavement. 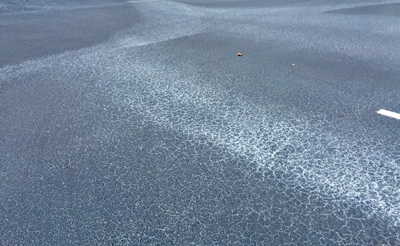 Excessive heat, due to the black coal tar’s absorption of sunlight, begins to cause cracking in the asphalt. If you doubt how hot these pavements can get, take a look at the paws of the dogs in Universe Two. On a hot day, a newly treated coal tar pavement can exceed 160°F, burning a dog’s paws in less than 60 seconds! Here in Universe Two, the coal tar wears off the surface every couple of years or so, requiring repetitive coats to maintain its shiny new appearance. Each successive treatment adds cost. The HOA in Universe Two is already regretting its decision. 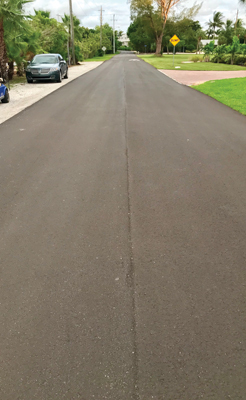 Unfortunately, since coal tar is incompatible with asphalt, once a pavement has been treated with it the HOA needs either to keep resealing the pavement with more coal tar or to mill the coal tar off before replacing it with new asphalt. Rapid aging evident on a parking lot treated with coal tar. So, the HOA in Universe Two opts to continue resealing the roadways every two to three years. Then, somewhere around year 10 or 12, an alternative strategy is required due to the road’s increasing deterioration, necessitating prior removal of the coal tar. Unlike the roads in Universe One, these roadways have entailed more expense in comparison with maltene-treated roads and are unlikely to match their 20-year design life. In addition, since coal tar surfacing tends to wear off, forming a fine particulate or dust as it ages, the streams, ponds, and atmospheres in Universe Two may begin to experience problematic environmental and health concerns. If we had time to explore a third universe, we could introduce you to other asphalt-derived treatments that safely and effectively provide shiny new black roadways without the hazards associated with coal tar. All road treatments are not created equal. Products that use asphalt rather than coal tar as their base are always preferred. Those using maltene-replacing emulsions offer the benefit of extended road life as well as reductions in long-term cost, community disruption, and environmental impact. So next time your community is considering pavement preservation, there’s no need to reach for the stars; just reach for this article! Chris Evers has served as a technical representative for Pavement Technology Inc. since 2011 and has been involved in the road building business since 1996. He is a past president of the APWA Florida Chapter and an active participant on its Legislative Affairs committee. He founded and continues to moderate the annual APWA International Public Works Director Roundtable and was also instrumental in founding the Florida Pavement Preservation Council. Chris is a popular pavement preservation educator/speaker throughout Florida and resides in Vero Beach. For more information on Pavement Technology, visit www.pavetechinc.com or contact Chris via info@pavetechinc.com.